- The SOT-223 Package can be soldered using wave or reflow. The formed leads absorb thermal stress during soldering, eliminating the possibility of damage to the die. Drain-to-Source Breakdown Voltage (VGS = 0, ID = 100 uA): 240V min. Zero Gate Voltage Drain Current (VDS = 120 V, VGS = 0): 10uA max. Gate−Body Leakage Current (VGS = 15 Vdc, VDS = 0): 100nA max. Gate Threshold Voltage (VDS = VGS, ID = 1.0 mAdc): 0.8V min. ; 2.0V max. - VGS = 2.5 Vdc, ID = 0.1 Adc: 10Ω max. 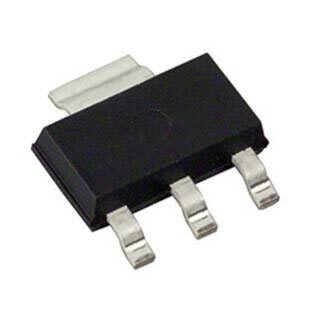 - VGS = 10 Vdc, ID = 0.5 Adc: 6.0Ω max. Drain−to−Source On−Voltage (VGS = 10 V, ID = 0.5 A): 3.0V max. Forward Transconductance (VDS = 6.0 V, ID = 0.5 A): 300mmhos min.